The Missionary Oblates of the Midwest Area are now official members of United Congregations of Metro East. 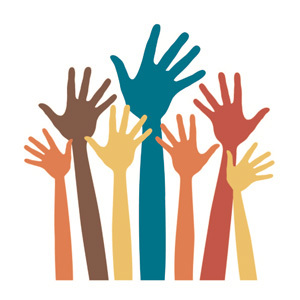 This ecumenical faith based organization provides a cooperative forum for member congregations in promoting issues of Social Justice, and offers social organizing training on behalf of the poor. They already have been working informally with the Ecological Learning Center in Godfrey, and look forward to partnering with the Hispanic Ministry at the National Shrine of Our Lady of the Snows in order to have greater influence in the surrounding Latino community. UCM was established in early 2000 with six churches. With technical assistance and training from the Gamaliel Foundation, they have grown to represent over 34 congregations with approximately 27,000 members. Member congregations represent the full range of communities in southwestern Illinois: older urban communities and new suburban areas, white, African-American and Hispanic, wealthy and impoverished. Thanks to Edward Chavez, OneLA organizer in Mary Immaculate and Santa Rosa parishes for sending this statement on the group’s latest success in LA! 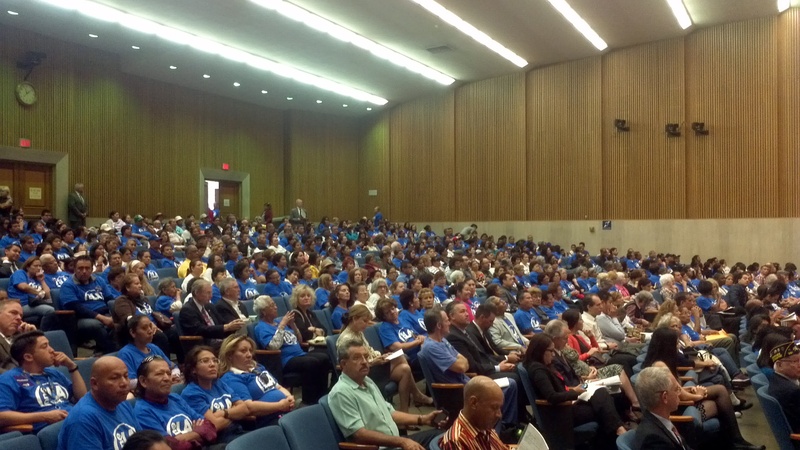 Over eight hundred people from churches, schools, synagogues, and civic organizations throughout Los Angeles packed the Los Angeles Supervisor’s boardroom on May 20, 2014. 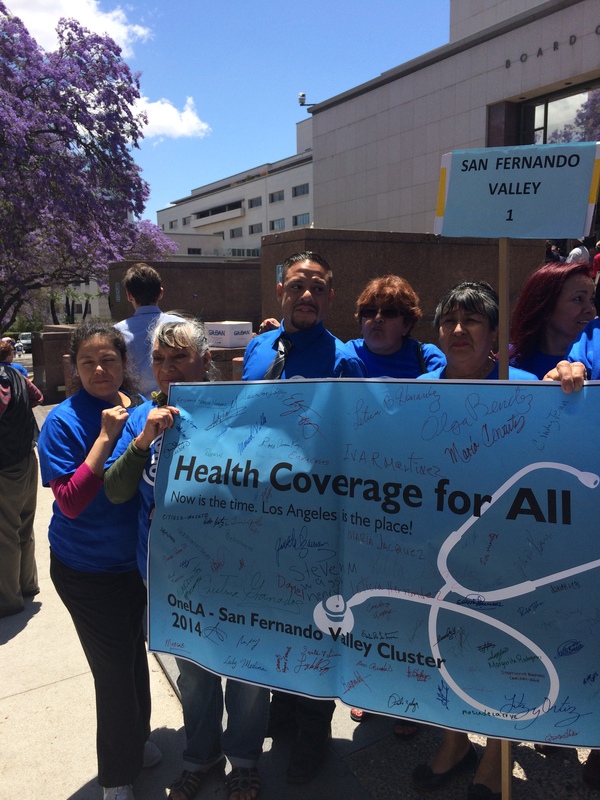 The message was clear: We are united in our call for increased funding for Healthy Way LA, the county’s health coverage program for the undocumented and remaining uninsured. Reactions from the Supervisors were mixed. Supervisor Mark Ridley-Thomas showed signs of support and was pleased with the large turnout from schools, clinics, synagogues and churches in his district. However, it was obvious that much work needs to be done to ensure a second and third vote to increase funding. During the board meeting, OneLA leaders were successful in securing a follow up meeting with Supervisor Gloria Molina and her staff. 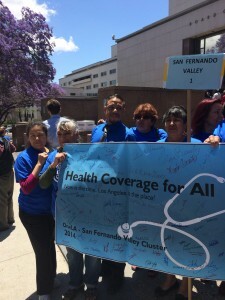 Supervisor Yaroslavsky has also agreed to continue the conversation. 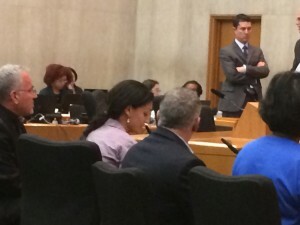 As a result of OneLA’s packing the Board meeting, the Supervisors called the Director of the County’s Health Services Department to drop what he was doing and come to the Board meeting. Supervisor Mark Ridley-Thomas asked Director Mitch Katz to offer an explanation for why nearly one thousand County residents are calling for more funding. Dr. Katz offered a weak response, reasserting that he does not see a need for additional funding. 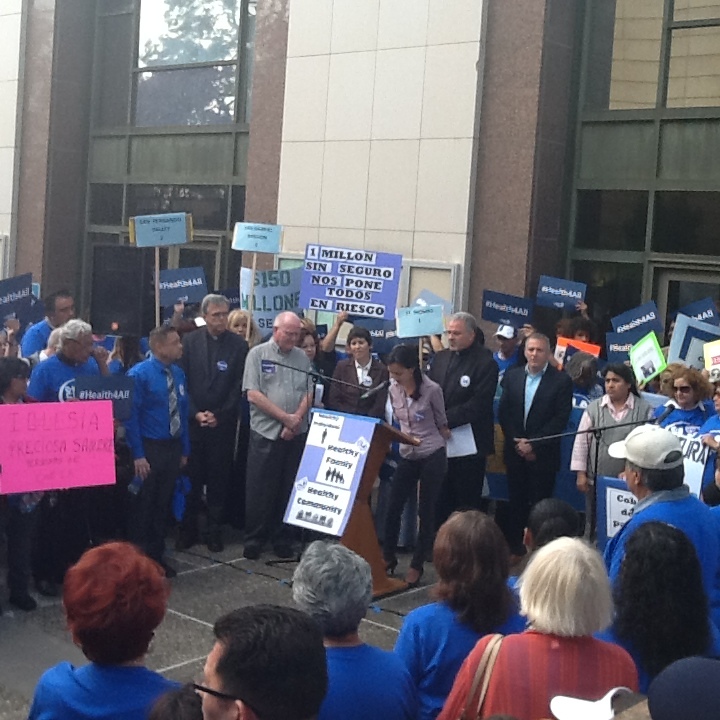 Our big turnout was instrumental in demonstrating to the Board that Dr. Katz’ assessment of the County’s need does not accurately reflect the real need in our communities. 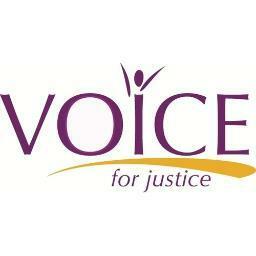 We must continue to make sure that the community’s voice is heard loud and clear- more funding is essential! We thank Supervisor Antonovich and his staff for ensuring that our leaders were recognized and given time to address the board. Speakers included: Jim Mangia, Director of St John’s Well Child and Family Center, Fabiola Sandoval of the Boyle Height’s Building Healthy Communities Collaborative, Mary Jackson from St Brigid Church and Fr. Bruce Wellems, pastor of San Gabriel Mission Catholic Church. 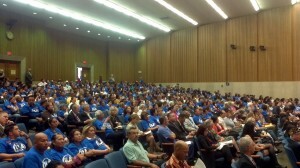 As our speakers closed, hundreds One LA and other organizations rose to their feet and applauded the Supervisors for their leadership thus far. We then left the boardroom together, determined to continue the fight- together as One LA. A follow up meeting will be held on Thursday May 29th 7:00pm, place to be announced. 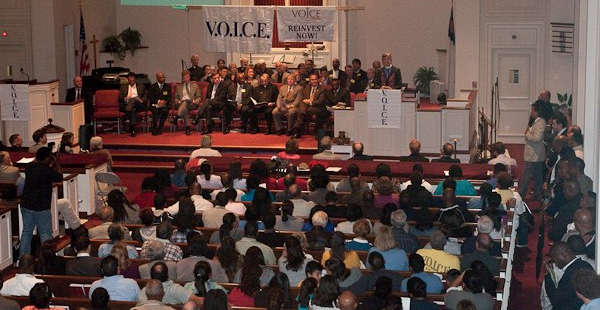 On the evening of Monday October 1st, VOICE (Virginians Organized for Interfaith Community Engagement) had a remarkably successful action to push forward mortgage relief for affected homeowners in Prince William County, VA. Following all-day, intense negotiations, last minute accommodations, and a lot of fluid politics, 800+ VOICE leaders packed St Paul United Methodist Church in Woodbridge, VA and emerged with some impressive agreements.